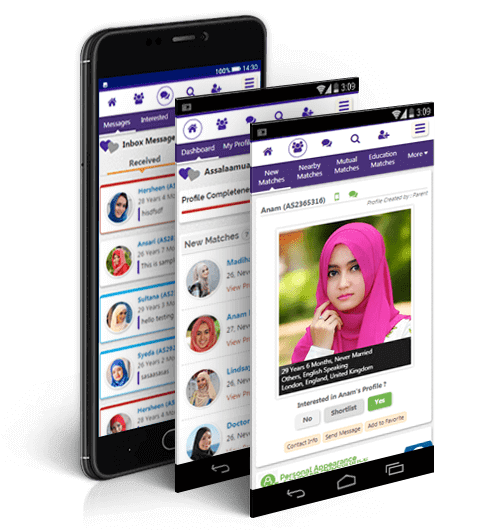 Download now and communicate with muslim matches on-the-go! Muslim Marriage in Islam is part of half-of-dheen. Nikah.com are the pioneers of exclusive muslim matrimony service trusted by muslims worldwide. Our aim is to help single muslims as well as divorced / widowed find their Islamic soul mate and to complete their half-of-dheen. Our platform has helped more islamic brothers and Muslima globally find their suitable Muslim match for nikkah. Our muslim matrimonial site connects millions of Islamic muslim male or female looking for their perfect muslim match. We are constantly using innovative ideas to enhance your zawaj search experience. Single Muslims looking for divorced Muslim, Widow Muslim for second marriage or be a reverted Muslim, Nikah.com's Muslim Shaadi bureau is your solution. Come be a part of us and we shall make your Nikah / Muslim Shaadi / Zawaj dream come true. In sha Allah. We were the first to cater to the needs of Muslim prospects worldwide. Our Muslim matrimonial site connects millions of Muslim brides and grooms looking for their perfect Muslim match. We are constantly using innovative ideas to enhance your search experience. We are determined to use our Muslim matrimonial website to benefit the Muslim ummah at large. Come be a part of us and we shall make your Nikah / Shaadi dream come true. In sha Allah.